For the past 25+ years, doctors have been honing the techniques that are saving the lives of children born with heart defects that are similar to my son’s. The oldest person I know with his condition, Hypoplastic Left Heart Syndrome (HLHS), is 27 years old. In addition to being a wonderful inspiration to our family; allowing us to see all that these kids are capable of, our dear friend, Jeni Busta, has also answered the many questions we have asked and has offered great advice for living well with this condition. 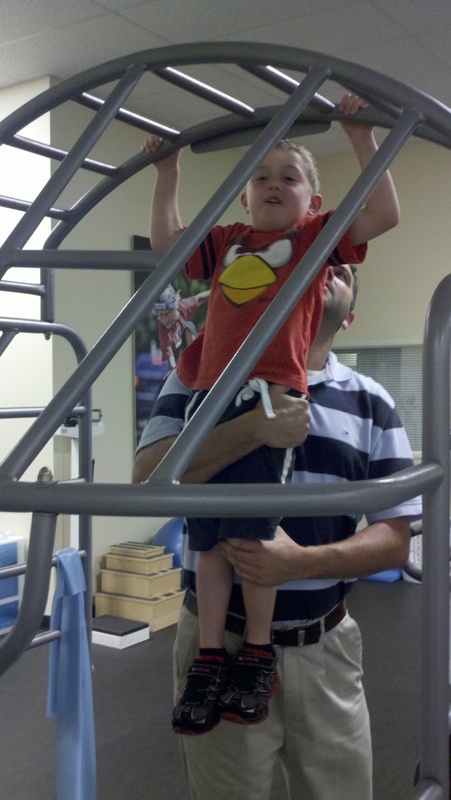 One of the things she recommended we do with Landon is to get him into physical therapy. 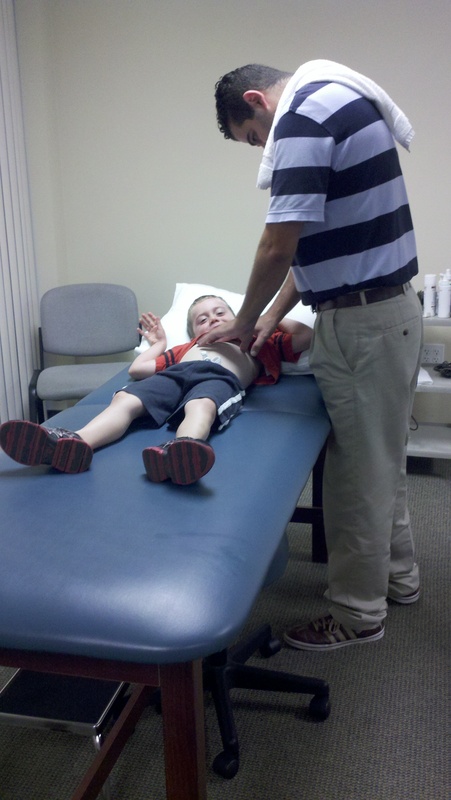 Many of these kids end up with back issues, flexibility issues and trouble with scar tissue. As these kids live longer lives, it is necessary to not merely make sure their hearts keep beating, but also make sure to take a whole body approach. While we do allow Landon treats and sweets, we have built a foundation for him with healthy eating. We are ensuring that his physical strength and flexibility are addressed, as well. I checked with Landon’s pediatrician and cardiologist and received the go-ahead and prescription necessary to receive physical therapy. 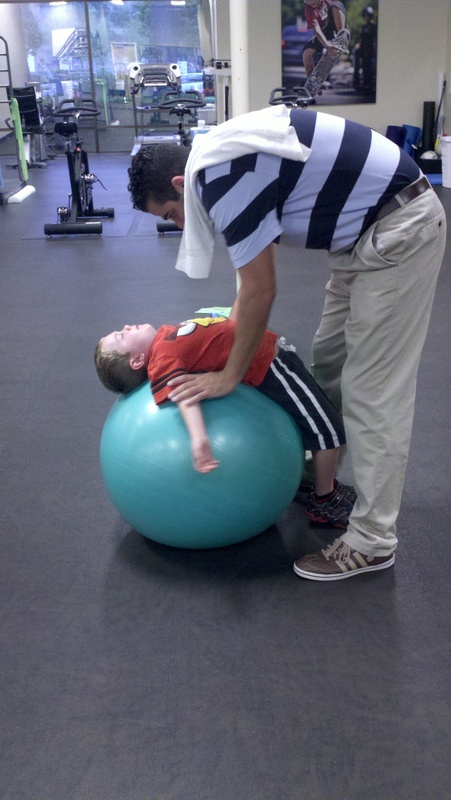 We found a wonderful Physical Therapist (DPT) at San Diego Sports Medicine Physical Therapy Center. Dean works so well with Landon and really makes things fun for him, while keeping his attention during a one hour session. 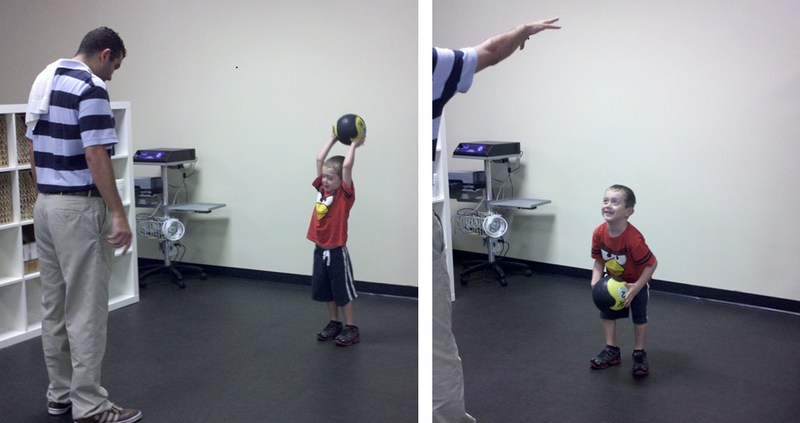 Landon really looks forward to his PT sessions! For him, it is a fun time, not just ANOTHER doctor’s appointment! In the few months Landon has been receiving PT, I have really noticed his balance, jumping and strength have greatly improved. I took a few photos of our latest session to provide an idea of the types of things they work on. Not all doctors think this method is necessary. Our cardiologist didn’t seem to think there would be a benefit, but gave the OK for us to do it. Landon’s scar does seem much less lumpy and thick than before. 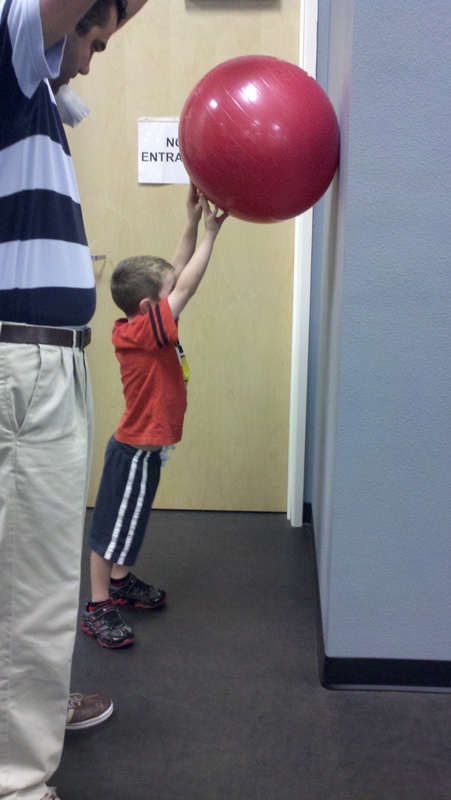 The first time Landon did this stretch on the fitness ball, it really showed that it was such a relief for him. He was so relaxed! The look on his face was priceless; he almost looked shocked that he was able to get such relief from a stretch. This is just a sample of what occurs during one of Landon’s PT sessions. Considering that during Landon’s first 5 1/2 years of life, he cumulatively spent an entire year recovering from his five open-heart surgeries, pacemaker surgery and numerous heart caths, the benefits he is receiving from physical therapy are beyond measure! *Our many thanks to Dean Makredes, DPT, for allowing us to publish our experience with him and for the wonderful care he provides Landon! **DISCLAIMER: This post is in no way providing medical advice. Before participating in any of the mentioned techniques, I would advise you to check with your physician, just as we did prior to starting our program.